With them is Air Asia’s CEO Joy Caneba (middle). How cool is that to see women invading the male domain. It is so inspiring! Air Asia Philippines, the country’s low cost carrier has re-launched their Manila-Davao route. Their first flight Z2611 landed at F. Bangoy International Airport on March 27, 2015 and I’m one thrilled blogger I’ll be saving bucks on my next Manila trip with this resumption. Other than this excitement, there’s another thing I’m so amazed about. This Air Asia maiden flight was actually flown in by an all-women crew and I happen to meet the women pilot. How cool was that! When I was still doing my Master’s course work on gender studies, it was so difficult to find women invading the male domain this area as we always know men to be the pilot and women are all FAs, as a correspondent. And then years, like yearssss later, I saw this! How hard could it be to fly airplanes? Everything on board is electronically connected and would run at a press of your fingertips. All you need is the knowledge, the courage and a strong heart to get through. Women are built with the outmost sense of exact calculability, tough mind and hold a high aptitude when it comes to handling emergency situation and above all what women need is a women-friendly venue where they can exhibit such skills. Thanks to Air Asia, women were given this immense equal chance. 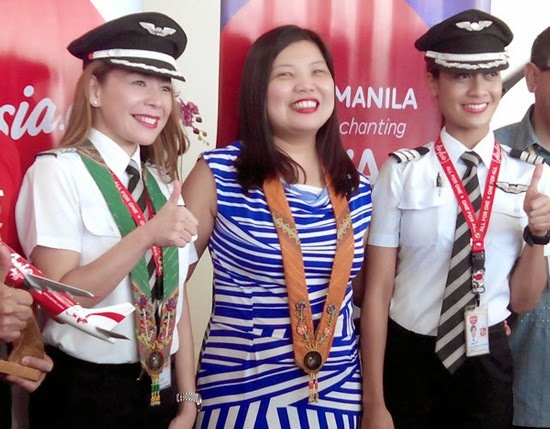 At present, women make up 40% of AirAsia Philippines’ staff with seven pilots and co-pilots combined, 253 on cabin and the rest are ground crew working as technicians, mechanics, and ramp officers in key operations and support service department. To all women out there who haven’t figured it out what career path to take in yet, consider being a lady pilot! See the world! Good Luck! It would be cool to be a pilot amo Ate?